Members of the Over 50’s Club set off in two cars heading for the North Circular and the crowded area of North West London. 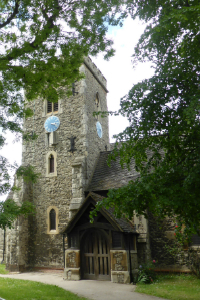 Our destination was the Shrine of Our Lady of Willesden in the Parish Church of St. Mary’s, founded in 938 by King Athelstan. Although the surrounding area is busy the Church is in the middle of an almost meadow like churchyard and has a rural feel to it. We were greeted by the Parish Priest, Father Andrew Hammond and made very welcome. We sat at a table while he made us a drink and we then had our picnic lunch. After we were invited to sit near the steps of the chancel while he told us the history of the church and pointed out the various things of interest, including a very beautiful table used in the communion service dating from 1601, and a memorial to a man who lived through the reigns of Henry VIII to that of James I. 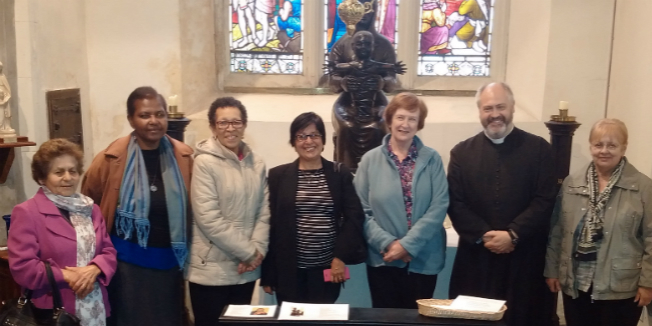 It was explained that the church is very much part of the life of the parish, it being opened all day long and is visited by a constant stream of people from all different walks of life. 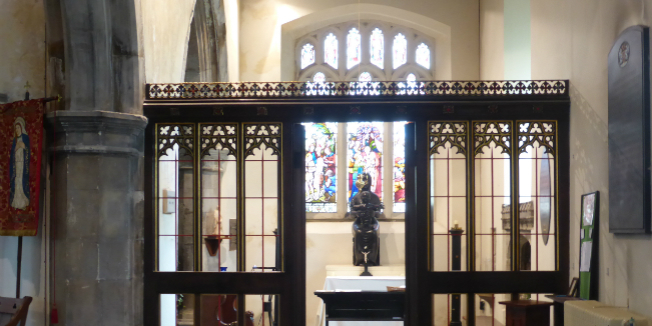 We then went into the Chantry Chapel next to the chancel to see the Shrine of our Lady of Willesden. 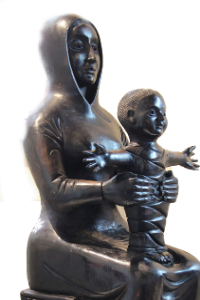 The image is of Mary holding the Christ child whose arms are outstretched. It is made of lime wood that has been ebonised. Father Andrew invited us to take part in a short prayer service which was appreciated by us all. This concluded a very interesting and uplifting visit. Thank you to Father Robert for arranging visit. For anyone wanting to go the Church it is open every day except Tuesdays.